Blu-ray Disc Authoring Plug-in for Nero 9 create Blu-ray Disc from AVCHD video. * Save time by modifying your editable Blu-ray videos right on the disc - no need to copy to another drive! The Blu-ray Disc Authoring Plug-in for Nero 9 is compatible with Nero 9 only, and does not work with Nero 9 Essentials or previous versions. just try Blu-ray Disc Authoring Plug-in for Nero 9 Now! 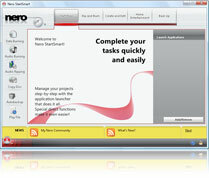 A html help authoring software that help you create help file quickly. DateInTray: today's date in the system tray. Now with popup calendar. Qweas is providing links to Blu-ray Disc Authoring Plug-in for Nero 9 as a courtesy, and makes no representations regarding Blu-ray Disc Authoring Plug-in or any other applications or any information related thereto. Any questions, complaints or claims regarding this application Blu-ray Disc Authoring Plug-in for Nero 9 must be directed to the appropriate software vendor. You may click the publisher link of Blu-ray Disc Authoring Plug-in on the top of this page to get more details about the vendor.